Imagine… finally discovering someone who truly cares about your success and believes in you. Imagine someone who has the knowledge and a step-by-step approach to help you get clear, confident and focused on your vision as a woman entrepreneur and business owner. You have the opportunity to personally work with a woman who’s been an entrepreneur for over two decades, and she’s on a mission to help women entrepreneurs get everything they want and deserve in life and in business. You don’t need to be told what to do. You need someone experienced and intuitive, who will listen, serve as a trusted sounding board, and help co-create a plan that will really work for your business, your goals and your dreams (personally and professionally). You’re not looking for a color by number business plan. Instead, you want to be an active part of the process. Joy specializes in leading already successful businesswomen to what’s next by revealing her proven, customized strategies that will give your business the edge. Joy is described by her clients as: intuitive, authentic, insightful, creative, a guide, thought-provoking, systematic, and best of all gets you out of overwhelm and into action with a step-by-step, results driven approach. From personal, private, one-on-one coaching or her “signature” small, intimate, hands-on group programs, Joy offers many levels of support and mentorship to women entrepreneurs. Read some of Joy’s clients’ Rave Reviews. If you are a woman entrepreneur or business owner that’s been in business a few years and you’re ready to make the leap to the next level of success, Joy and her team are here to help you! If you’re serious about creating rapid results and growth in your business with a desire for private, personal attention, Joy wants to personally work with you. In your private Strategy Power Hour with Joy, you’ll get clear and focused on the easiest, most direct path to make more money in your business without burning out. Joy’s 180 Day Business Acceleration program will dramatically increase your business results with personal, private consulting and strategy you can depend on that will boost your confidence, clarity and consistency. Joy will help you peel back the layers of your business and focus on where the income “gaps” are and how to close them to bring more profit to your bottom line. Joy will show you how to create systems in your business that save time and money. Joy has helped scores of women just like you create high-quality marketing services and programs that generate more visibility and generate more profits and higher levels of success along the way in this program. Sometimes all it takes is someone to hold your hand and take you step-by-step through a proven process that will pave your way to success. I’ve spent years and hundreds and thousands of dollars figuring out what works (and what doesn’t) and I’m ready to share this valuable information with YOU. You are on top of your game, you’re likely already generating a substantial income, and you want to do more. The EDGE is Joy’s top tier private, coaching and consulting program which offers a blend of private, personal coaching with Joy along with a group element to ensure you get the maximum benefit and real results. If you’re looking to grow and scale your business, the EDGE may be for you. Millions of women are shifting the economics in our country and creating jobs and opportunities for others – on their own terms. Recent research shows that women-owned businesses are increasing at a rate of five times the national average, however ONLY 2% of women-owned businesses are breaking into the ‘two comma club’ in revenue. It’s time to dig deeper and talk candidly to the women who are rocking their profits. 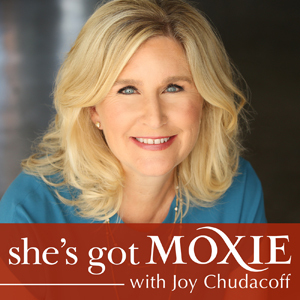 Each week, I’ll showcase today’s thought leaders, renegades, mavericks, pathfinders and of course, women who are flexing their moxie muscle. Ranked by iTunes as One of The TOP 100 Business & Career Podcasts to Listen to!